GeoCode is a LISP utility for AutoCAD 2014, 2015, 2016, 2017, 2018, 2019... (plus Architecture, Civil 3D, Map 3D, MEP) which automatically creates street address for picked points (location) and converts full addresses to lat-long coordinates and geomarkers. The What3Words command variants use the 3-word address code. 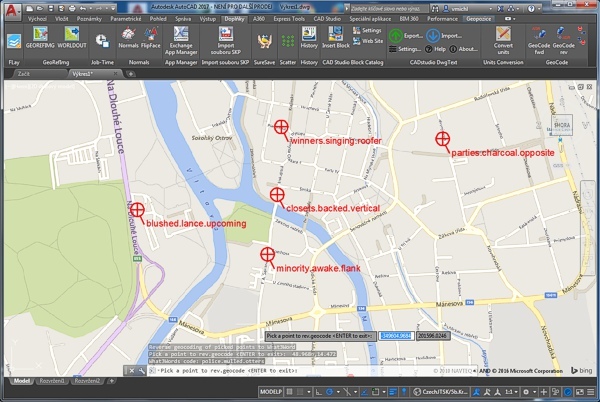 GeoCode supports the AutoCAD Live Maps. This function uses internet access to Google API and what3words API. Load this utility with _APPLOAD. Load the GeoCode.VLX with APPLOAD and start the GEOCODE command. Pick a point and GeoCode will display its full street address (or the address of the nearest location). The GEOCODEA command prompts for a full address and returns its lat-long coordinate plus creates a geomarker on this position (with the address as its label). In AutoCAD you need to first set the _GEOGRAPHICLOCATION and your current layer must be ON. The commands GEOCODEW3 and GEOCODEAW3 use the What3Words service to convert a location to/from a 3-word address code. In Map/Civil you need to first set the coordinate system of your map. "Tylova 153/17, 370 01 Ceske Budejovice, Czech Republic"
works like the GEOCODE command, returns the address string. GEOCODE is a free utility by CAD Studio, do not publish it online on other than CADstudio's web servers. Contact CAD Studio for feature enhancements.